So while all of us were busy turning the consultation paper on differential pricing of data services put out by TRAI into a battle ground for Net Neutrality in India, on the sidelines, we decided to checkout Free Basics in action. So we got hold of a Reliance SIM card and a dying smart phone to take the free* ride. Turns out, Reliance chose to carry on providing Free Basics on its network, openly violating the regulator's order to temporarily shut down the service. Neither is Reliance or Facebook informing its users about the order. There are about 135 websites registered with Free Basics. A curated, most likely hand-picked list of 45 services is provided as soon as the app opens, and the rest of them are hidden under 'More Services'. Primarily, these are information oriented websites like news, encyclopedia, guides and tips. Further, there are services like classifieds, blood donation etc. 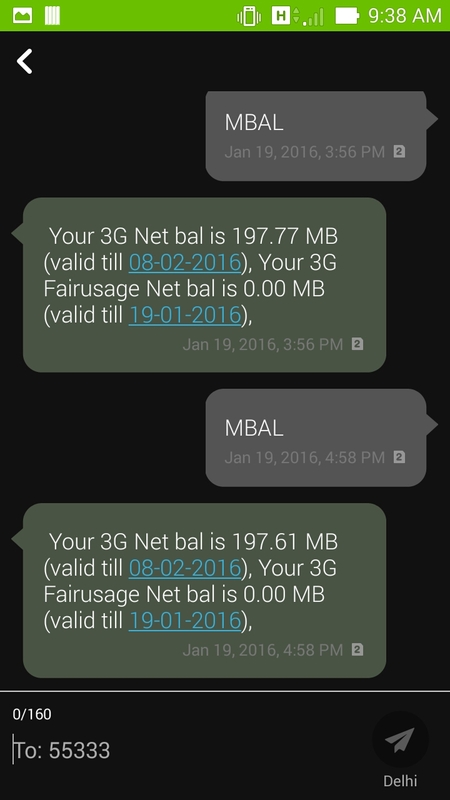 To see the full list of services available on Free Basics, browse through the below gallery of screenshots. There is one site that introduces users about the basics of Internet on a site that isn't particularly branded. Based on traffic analysis, we determined that the site is served from an IP on Reliance's network. There is a disclaimer in the footer denying responsibility for the accuracy of information on the site. The only website in Free Basics currently that allows users to become content creators is Wikipedia, except sending comments on news articles. Although we weren't able to get the comment submission form load up on TOI's articles. The Wikipedia editing experience seems to be the same as editing it over a regular 3G network. Interestingly, Free Basics doesn't use Wikipedia Zero, the project from Wikimedia Foundation to provide free-of-cost access to Wikipedia. WMF has taken a stand on Net Neutrality different from that of its usual friends and allies in support of this project and its aims. 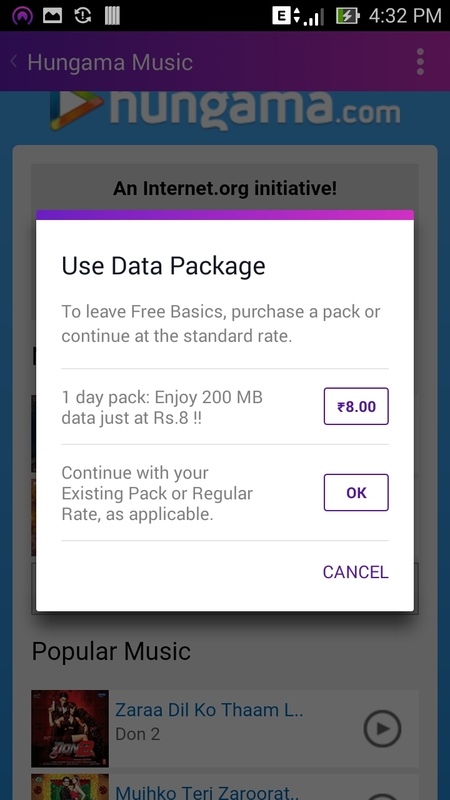 Free Basics seems to be using the regular method of accessing Wikipedia based on (a) the URLs being requested and (b) the absence of the usual banner on top of Wiki articles which notify its users about free data usage. There are no video sites like Youtube available through Free Basics. We were however able to use a music streaming service from Hungama.com which had exactly 4 songs available for free. Unlike the dynamic nature of their service on the 'full' website, the list on the free basic version seems to be a static one, which has the same 4 songs available for a few days that we have been observing.Any of the other links that offer more music, pop up a message notifying the user about going out of Free Basics and applicable charges for further usage. This is an example of how Free Basics users could be subjected to inferior quality services. The warning about data charges being applicable for accessing anything beyond the meagerly available content, makes the user give a second thought before proceeding. Some of the sites listed in Free Basics appear to be personal blogs of individuals. Here's a direct link to one such blog which appear as is on Free Basics. After clicking on the service from the list, the app sends a request to the proxy server over HTTP with the target website's URL and the further communication happens over SSL which we haven't been able to inspect so far. Watch out for more updates about this. We used Free Basics for almost an hour exploring the content on its partner websites. 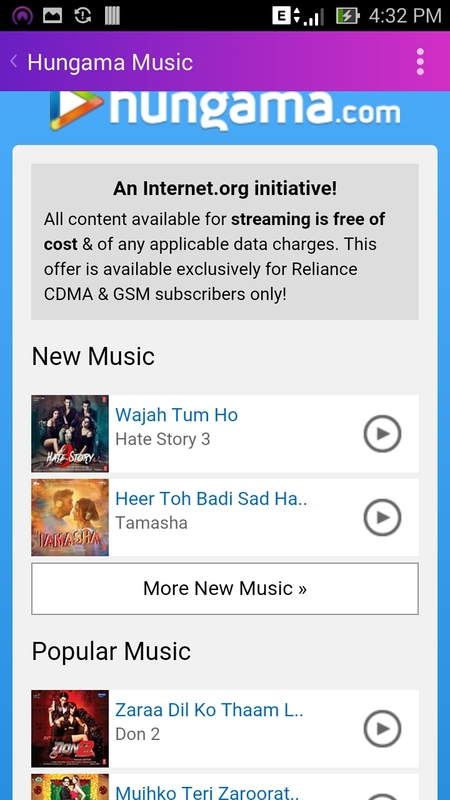 We also streamed all the 4 'basic bollywood' songs from Hungama's website to account for some significant data usage. We checked the available data balance before and after the one hour period. The balance report from Reliance confirms that the data usage through Free Basics has been zero rated by Reliance. 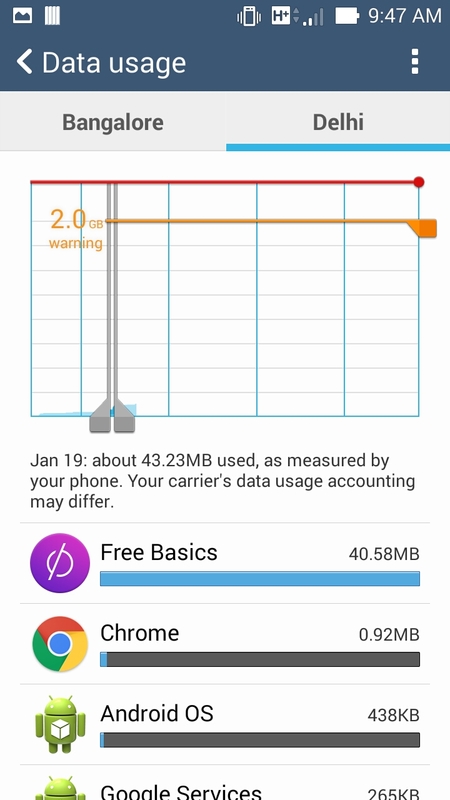 The data usage accounted by the phone towards Free Basics app was about 40MB during that period, while Reliance reported only a consumption of about 1MB (used by other apps on the phone during that period). 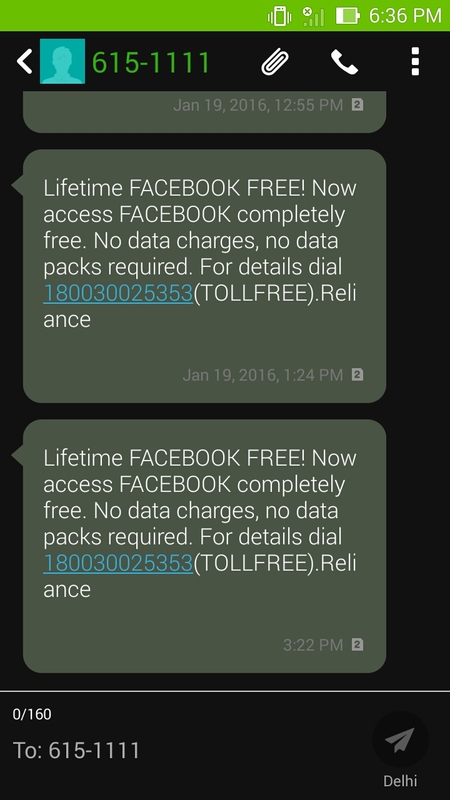 Of course, when we were away, there were these promotional text messages once in a while from Reliance, informing us about zero-rated Facebook for lifetime. 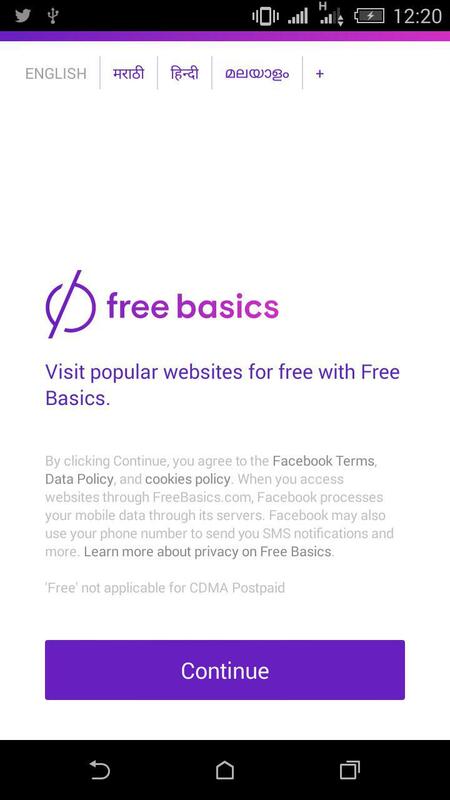 Watch out for more updates on this post, as we continue to find out more about Free Basics. Tweet to us @SFLC.in about what else you want to know.